Lunchbox by Activlab is a response to the needs of athletes forced to eat meals away from home. It guarantees that the food stays fresh, it has a tight closing, and it is safe thanks to the use of high-quality polypropylene that complies with all the standards essential for food contact materials. Every athlete who takes their favourite discipline seriously is aware that their diet is a significant factor in the struggle for desired effects. It must be precisely adjusted, both when it comes to the size of meals and their type, depending on the time of the day, activity, circadian rhythm, and many other individual factors. Moreover, it is of utmost important to have meals regularly in order to provide the organism constantly with the fuel essential to regenerate after heavy workout sessions. It often forces athletes to eat away from home or any other place with access to a kitchen. In that situation, the only solution that prevents you from neglecting the diet and, consequently, your goals, is to prepare food at home for the whole day. The main problem when it comes to preparing meals in advance is their storage and transport. The lunchbox you are planning to keep your food in cannot react with the products or release toxic compounds that you could consume with food later. That is why the producer of this lunchbox used high-quality polypropylene for production, which is characterised by full safety when in contact with food. The box has all necessary certifications required by the Polish law regarding food contact materials. What is more, an extremely important feature of lunchboxes is their tightness. It is relevant for two reasons. Firstly, a tight closing determines whether a product stays fresh or not. It often happens that supper is closed in a box from the moment it was prepared in the morning, so the factor has a great impact on the quality of the meal. Secondly, the tightness of the box ensures its trouble-free transport. Liquid parts of a meal spilling in a bag, such as sauce, are a real nightmare for people who follow the so-called “diet in a box”. A tight box eliminates the possibility that even the smallest amount of its content spills out. The type used in this product is the highly-valued click-type closing. Another factor of great importance is the box’s ergonomy. It cannot be too small so that the whole meal fits in one box. On the other hand, it cannot be too big so that it does not take too much space in a bag or, for example, a shared fridge at work. The producer of the box designed its size so that it fits perfectly the most popular portions chosen by professional athletes. It ensures maximum ergonomy of using it. Importantly, the box can be safely washed in a dishwasher (in temperature not exceeding 40oC). It is also possible to use it to heat up meals in a microwave, provided that you remember to take the lid off. 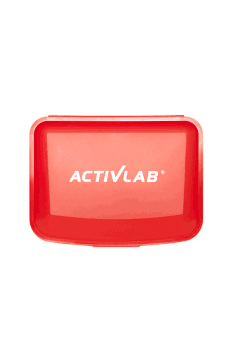 To sum up, the lunchbox Activlab is a perfect solution which allows you to transport your meals safely and comfortably. Thanks to that, it makes it easier for all people who follow a diet, which is already connected with a lot of trouble and sacrifices. In order to preserve the properties of the box for a long time, you should follow the producer’s limitations regarding the temperature of washing. When it comes to its tightness, it is also important that when washed, the box should not be pressed by other dishes or elements of the dishwasher. In the case of manual washing, it is a good idea to use a soft sponge in order to maintain the quality of the print on the box. The print can also be damaged by sharp elements washed along with the box. High-quality training gloves Prevent abrasions and calluses. Gloves in blue for women training fitness. Made of high quality materials. Well suited for hand training gloves. They are made of genuine leather.